You are currently browsing articles tagged San Diego State. The problem with “grass roots” as a metaphor is that it reduces its contributors to the miniscopic. Not microscopic, because then you couldn’t see them without a microscope. But miniscopic, meaning they’re small. You have to get down on all fours to eyeball them and say hi. So I’ve been thinking about alternative meaphors where large movements are involved. For that you have to go deeper. Not into the dirt, because that has connotations of filfth and death. Rock roots is okay, in the sense that serious rock for the most part is solid, or what geologists call “competent”. You can build on it, and with it. The largest slabs of it are “tectonic”. But maybe we can go deeper than that, below the Earth’s crust. How about “magma roots”? That occurred to me while reading Ron Schott‘s post, Building a Google Earth Geology Layer. Ron is a hard rock geologist who has been a good source of wisdom (and occasional correction) toward my own geology obsessions. What Ron proposes (in both his posts title and its detail) is a great idea — for Google, for the geology field, and for the rest of us. What I’d like to do here, with the help of the geoblogosphere (via the comments to this post, initially), is to set out some goals, examples, and use cases that could guide the development of a Google Earth geology layer. If there’s interest in building on this idea, I’d be happy to set up communications tools, create KML tutorials, or do anything else to facilitate a coordinated effort to develop such a layer. Hopefully, by leveraging the knowledge and efforts of the geoblogospheric community, along with excellent new resources for developing KML, we can make a real start toward building a useful geology resource. For now, what I’d like to do is to begin to collect best practices/examples of good uses of KML in illustrating geology in Google Earth. I’ll start by pointing out the USGS Earthquake Hazards Program’s collection of Google Earth KML files and another collection of geologic KML resources at San Diego State University. These should give you some idea of the sorts of things that will be possible. 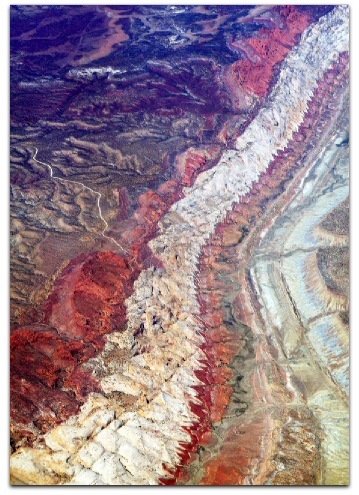 Also helpful would be use cases – how would you like to use a geology layer in Google Earth? Suggestions here will offer us guidance as to what the most important elements of a Google Earth geology layer should be. I’m not a geologist, but I want to do everything I can to help raise this barn. Or, to keep from mixing metaphors, uncork this volcano.